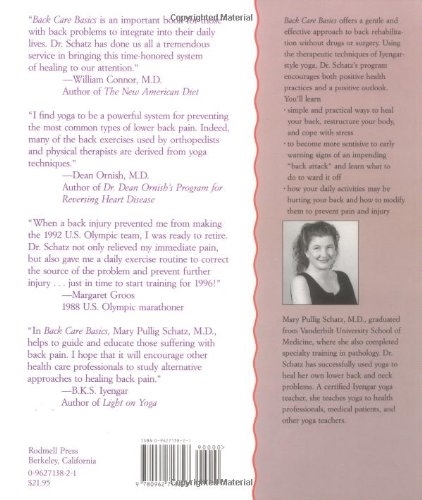 Back Care Basics offers the low-cost solution for back care in the new millennium: therapeutic yoga. Dr. Schatz’s approach to back rehabilitation is gentle, effective, and doesn't resort to drugs or surgery. Her program encourages both positive health practices and a positive outlook; the important tools needed for prevention and healing. Dr. Schatz has designed this program to help those with pain from chronic musculoskeletal back and neck strain, spinal arthritis, osteoporosis, premenstrual syndrome, pregnancy, and scoliosis.